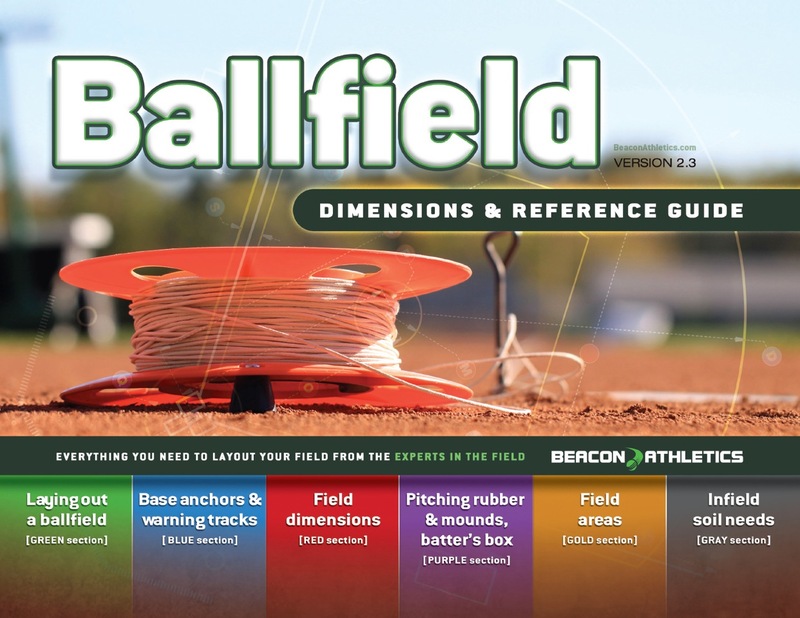 “Ballfield Dimension & Reference Guide” by Beacon ! “Beacon Athletics has just released the latest update (version 2.3) of its highly sought after “Ballfield Dimension & Reference Guide”. 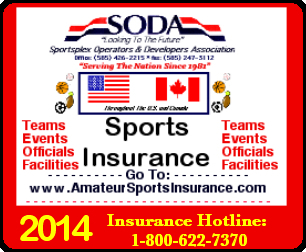 It is a must-have information source for architects, contractors, and most of all, ballfield groundskeepers. The booklet is written by Beacon’s own Paul Zwaska who is the former Baltimore Orioles Head Groundskeeper (1985 – 2000). The guide contains a wealth of knowledge pertaining to designing, building and maintaining baseball and softball fields. 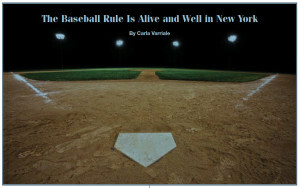 The 32-page booklet is updated every 2 years in order to maintain up-to-date changes on any field dimensions by various baseball and softball governing bodies. 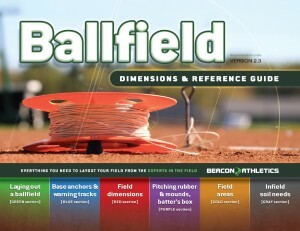 The guide not only provides an extensive listing of dimensions for both baseball and softball, but also contains information on space needs for fields, step by step layout instructions, warning track design, instructions on proper installation of base anchors and pitching rubbers, infield soil information and recommended specifications and much, much more. * Beacon Athletics is a SODA National Associate Member. The Skills That You Need To Aquire For Good Crowd Management ! Here we discourse about mainly about Crowd Management system. Whenever you will be responsible for handling a condition in which a large number of citizens are in one place, you will need to implement the strategies that are used in crowd control. These strategies can be applied to everything from a party that is getting out of control to a large-scale protest in a major urban area. Of course, the degree to which it will be implemented will vary with the size of the crowd. Skills required for handling large crowds include the ability to give clear instructions and a great sense of humor of a crowd and a feeling of confidence. In addition to these skills, you will need to have some knowledge of the techniques of crowd control and access to some basic tools for crowd control. One of the majority important skills you can have if you increasingly in charge of crowd management are the ability to give clear instructions. If you are unsure of what you want people is done, it will not be safe either. That’s when chaos arises. You need to be able to clearly identify what you desire and then be clever to share that information in a clear and authoritative manner. 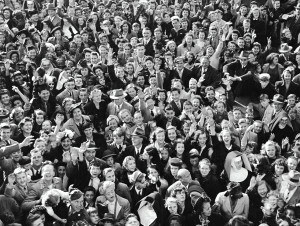 If it’s a large crowd of people, have the added ability to be able to delegate tasks to people who are helping to instruct the crowd. In a party setting, this could mean clearly tell a friend to turn off the music and empty alcohol. In a large group, it could mean managing large groups of security officers for the best positions of crowd control. It is significant to be intelligent to tell people what to do when things start important to be able to stop the problems. To do this, here you need to have the greater capacity to understand the underlying mood of the crowd. If you are here with the type of person who can study an entire game and immediately say people are drunk enough to cause problems or that couples could begin fighting an outbreak of fighting, then we will have the basic skills you need to identify potential problems in a crowd. Nipping problems inside the bud is an important part of the crowd control. Finally, you will have to have a strong sense of self and the confidence to perform crowd control. If you do not think you can handle a situation then no one else is going to take seriously the attempt to do so. Hopefully you have that inner confidence, but if not, then you will have to summon all your inner strength and go with the fake it till you do approach. Once you have developed the skills to give clear instructions, the ability to detect the real mood of a crowd and the confidence you need in order to be a leader, then the rest of the crowd management should be easy for you. Some advanced strategies and some access barriers and other crowd control tools that allow you to control any group if you find yourself in a position where he has to. So here we get some idea about Crowd Management system. Food Handling Safety in Concession Stands ! improper food handling in concession stands. General Liability generally covers such occurrences, but preventing them is preferable. What follows are some basic tips for reducing such risks. Concession stands must adhere to local food licensing and permit laws and regulations. All concession workers should receive training in proper food handling by management. Only purchase food from reputable, good-quality sources. Do not purchase or serve any food past the expiration date. Avoid serving food prepared at home, other than baked goods. Use of gloves and hand sanitizers offer additional protection, but are not a substitute for frequent hand washing. Food handlers must be symptom-free of illness (coughing, sneezing or sniffling, fever, nausea, vomiting, diarrhea) when handling food. Food handlers must use appropriate utensils, gloves, or deli paper when handling food. Store all food off the floor. All food should be covered and spills/drips continually wiped down to discourage insects. Keep trash cans covered at all times with tight-fitting lids. Foods requiring refrigeration to be held at 40° F or lower until being served. Keep a thermometer in your refrigerator/freezer to ensure fridge is maintained a 40°F and freezer at 0°F. Perishable food should not sit out of refrigerator longer than two hours. Disposable utensils and paper products should be used to reduce cleaning and contamination. Do not wash or reuse disposable products. Sanitize and wipe down all food preparation surfaces and concession equipment frequently. Do not overfill garbage cans, and empty them frequently. New Protector Flush System Halts Catastrophic Toilet Leaks ! Aqua Mizer, Inc. introduces the Protector Fill Valve with Adjustable Flush System providing dramatic toilet leak protection and daily water efficiencies. [Sarasota, FL – April, 2014] Aqua Mizer’s newest product is the patented and patent pending Protector Fill Valve AM1007. The Protector will turn off the fill valve in the event of a runaway leak where water runs uncontrolled out of the tank, and the tank cannot refill. If the flapper gets stuck, the tank cracks, the bowl clogs, or some other problem occurs, and water is running uncontrolled, the system will turn off the incoming water in under a minute. This could prevent untold amounts of water being wasted, and more importantly, save tens of thousands of dollars in flood damage, and even much more if you live in a multistory building. The Protector Fill Valve is the only device on the market that will prevent a catastrophic flood caused by leaks of this nature. When combined with the features and benefits of the Adjustable Flapper, the first innovation launched by Aqua Mizer, Inc., this new system overcomes all problems inherent in toilet tank flush products. It prevents insidious leaks, stops catastrophic flooding, reduces flush volume, and increases flush velocity to ensure a complete bowl clearing with just one flush. A patented fill valve that prevents stealthy leaks and keeps 75,000 gallons of water from flowing into your toilet bowl and going down the drain. A design that includes zero internal metal parts to corrode or clog. 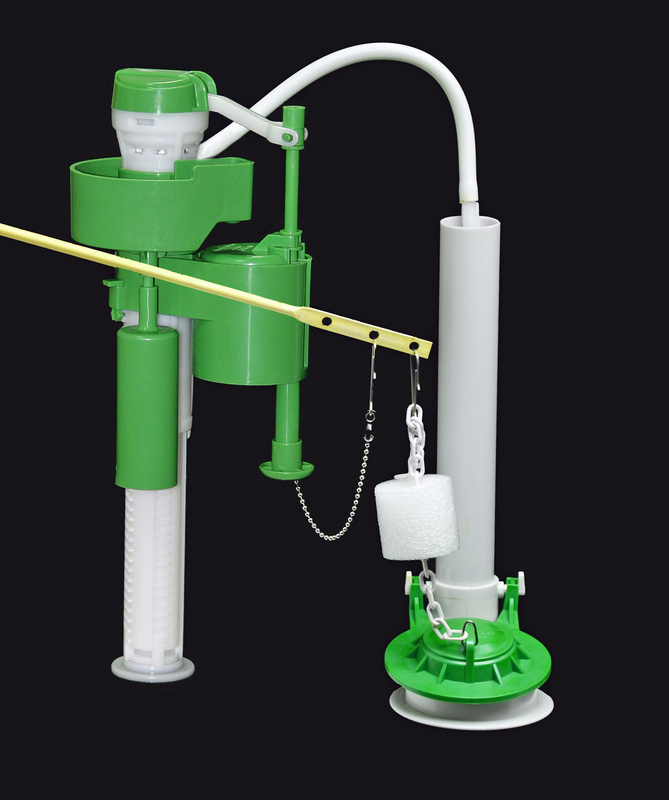 An adjustable flapper that flushes with less water and more velocity, allowing one strong flush instead of two or three weaker flushes to clear the bowl. A sediment filter that is easily removed for cleaning. A 10-year warranty on the fill valve and five years on the flapper. 1.5 Trillion Gallons of Water! The EPA and the American Waterworks Association tell us that this much water is wasted each year just in the USA by faulty, leaking toilets. According to their research, at any given time 20% of all tank toilets in the U.S. are leaking. As yet there has been no formal means of addressing this prevalent water loss. The government focuses on mandating low-flow toilets saving 1/2 gallon of water per flush (about 3,000 gallons/year), but that’s a drop in the toilet compared to 75,000 – 200,000 gallons from just from one undetected leaky toilet. The flush segment of the toilet bowl industry is dominated by a handful of players that offer basic products that flush toilets, but do not effectively reduce water consumption. The new Protector System is a break-through product unlike anything available on the market. 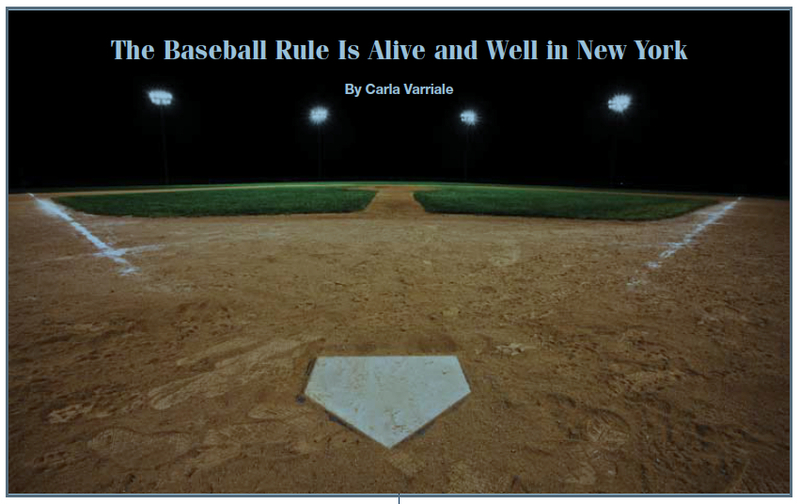 The Baseball Rule Is Alive and Well In New York ! errant baseball, bat or even promotional items is the greatest. and operators cannot be held liable to injured spectators. and Colorado, have enacted baseball-specific liability statutes. owned and maintained by the defendants. neither owed nor violated a duty of care owed to the plaintiff. (1981). See Haymon v. Pettit, 9 N.Y.3d 324 ; Roberts v.
satisfied and defendants could not be held liable. alive and well in New York. Family SportCation = Big Business ! 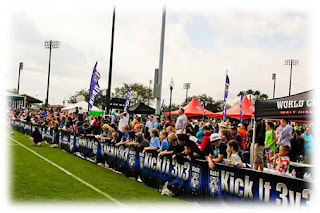 The consumption of youth sports tournaments, elite programs, family sport-cations, equipment, uniforms, private coaching, digital media platforms and access to mom and dad consumers are all feeding into a multi billion dollar youth sports industry. Long gone are the days of local recreational leagues, orange slices and stopping for an ice cream as a post game celebration. 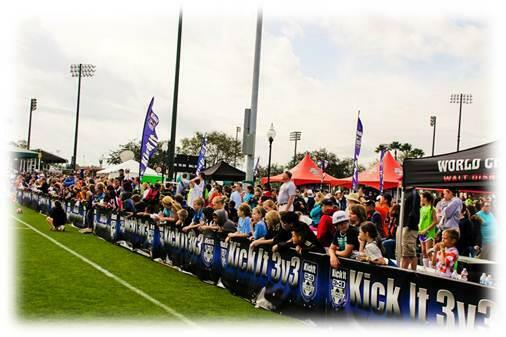 Today it’s about travel teams, weekend long tournaments, hotel rooms, flights, sports drinks, pop up tents, condo coolers, 7 uniforms, paid coaches, indoor training facilities, $50 under shirts and $150 cleats…and that’s just for the parents! 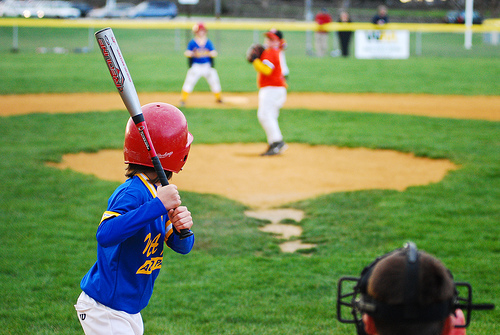 Today there are over 30 million boys and girls playing youth sports compared to under 8 million in 1970. 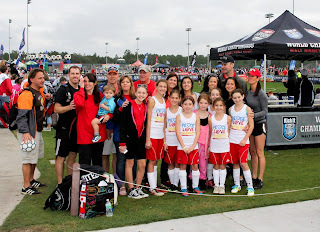 As my family and thousands of other families across the US enjoy these weekend Sport-Cations together and the friendships with other like minded sports families, we are not just providing for our kids with life long friendships and memories, but also preparing them for a great big world that is beyond the 15 mile radius most of us lived in growing up. We are also preparing them for the reality of the global competition of life and how to sacrifice for those things you enjoy doing. Take a look at High School sports and cable networks. High School teams are not just taking school buses to games anymore. 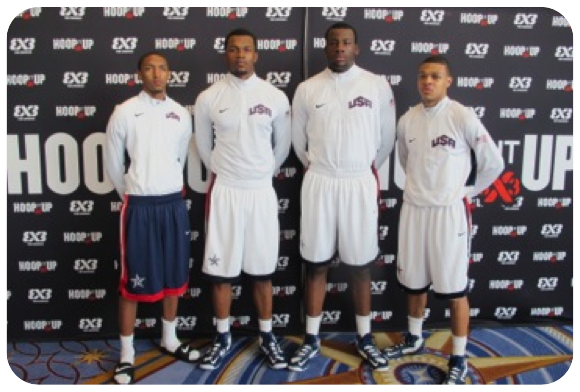 They fly across country to play on national TV. Why, because of human nature to compete and bragging about being the best and playing the best and the need to consume that competition! It’s a business ladies and gentlemen and it starts when they are about 10. The clock is ticking and the meter is running. As thousands of dollars are spent each year by millions of families and brands eager to gain access to moms and their kids, this is a multi billion dollar industry and one to take notice. These are real consumers who travel multiple weekends a year who are in the prime sponsor upper middle income demo and are a captured audience stuck at a field for 2-3 days over the weekend and spending money on merchandise, food & bev and willing to try any new product that is onsite for free sampling. This is a real business with real revenue and real participation without player salaries, striking refs and parents who are willing to travel and spend money…..Although maybe not every weekend in Scranton! Ooma Phones $ave Lots Of Money ! CLEVELAND, OH – New stats show the average bill for phone, Internet and TV runs more than $150 a month. That has some people looking to cut corners. One way to trim your costs is to cut the cord and switch to a phone service that delivers calls via the internet. Ken Lipke switched his phone service to Ooma just over a year ago. “I think it’s a no-brainer. I’ve saved, since I’ve used it, over $400,” Lipke said. Ooma is a device that connects to your Internet service on one end and your regular phone on the other. There’s a one-time cost of about $150 for the black Ooma box and then the savings begin. Local and domestic long distance calls are free. You pay just a few dollars per month in taxes. International calls cost extra, but the rates are also very low. In a survey of more than 50,000 Consumer Reports subscribers, Ooma is the top-rated phone service. There is a limit of 5,000 minutes of calls per month. If you want to keep your home phone number, you have to pay an additional one-time fee of $40. “As for reliability and the quality of the calls, our survey found that Ooma’s ratings were on par with traditional service from big companies like AT&T or Verizon,” Consumer Reports’ Rosalind Tordesillas said. This applies to both private and business phone lines as well !